Men’s travel bag has seized to be just a practical matter a long time ago. Today it is also a question of style and it is equally as important as the clothes you are carrying inside of it. There are so many things to consider when buying the bag, how will it pair up with your stylish travel clothes, among others. Knowing that this is a much harder decision than you have given it credit to be, you understand that you have to invest a bit more consideration into this purchase. If you are not sure what to look for, here are a few tips that will help you buy the perfect travel bags for your adventures or business trips. The first bag you will need (and for every travel) is a man’s drop kit, where you will pack your toiletries, razors, toothbrush, etc. For business papers, airline tickets, books, laptops and some essential carry-on, you can use a casual rectangular briefcase. If you are traveling for some shorter period and you need a clean businessman look, then opt for an attaché case. When the need for comfort outweighs the need for style, you can carry a backpack or a messenger bag. Regular carry-on luggage is neat when you need to avoid check bag fees, but you still want to take enough things with you. The three remaining options are a weekend bag, two-wheeled suitcase and upright suitcase. 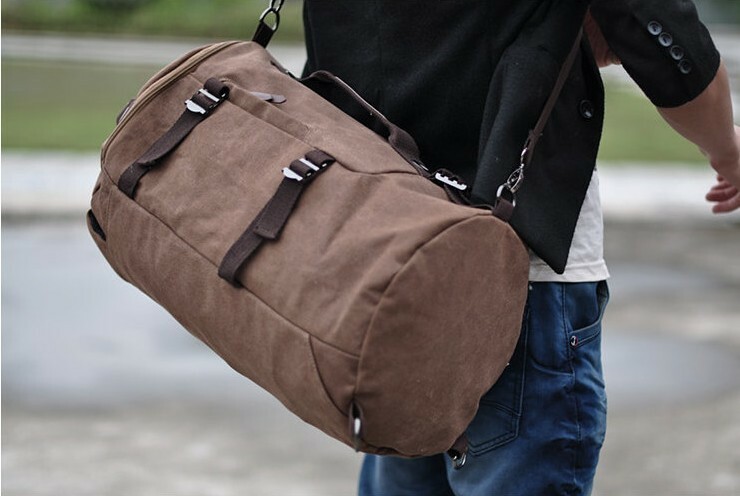 Now that you are familiar with different kinds of man’s travel bags, it is the time to talk about their durability. A travel bag is not something you buy every year, so you should look for a product made to last. This means that high quality leather goods will always be better than faux leather or cotton, but you should still check for the quality of the specific product. Do that by observing the stitching which is supposed to be strong enough to endure the weight-load and usage demands. Travel bag has become a statement piece for men, so do your best to choose the right one. The bag should match your personal style (sporty, elegant, businessman, etc.) and the prevailing colors of your wardrobe. Black is always a good option, but you can also go for a more casual brown color. Vintage bag designs are currently in vogue, because of their timeless appeal and the ease of combining them with various outfits. Straps and clasps can also impact the overall style of a bag. Women tend to buy beautiful, rather than practical. Do not make the same mistake, since you are buying a travel bag meant to last for years. Consider how often you will use it and what will you carry in it (lap top, clothes, all the travel supplies, etc.). Search for a bag with adequate buckles or claps and padding to prevent a thief to access its inside easily. The bag should have a large number of pockets and compartments (smartphone pocket, secure pocket for wallet and compartment for wires and cables) to pack all your belongings in an organized manner. Some features might not seem important at the first glance, but you should consider them too, because sooner or later they will cross your mind. If you are buying a leather bag, for instance, be aware that the dyes that are used in conventional leather production can be extremely toxic for the environment. There are, however, some manufacturers which are using vegetable dyes to avoid such harmful effects. Also, when buying handmade products you are contributing to development of small business and you can get a unique model which will make you stand out from the crowd. It is possible to find a bag which is, at the same time practical and stylish, so start your quest today.